You guys sounded off on my insta stories that you wanted holiday decor posts and you wanted it asap, so here we go! This is a bit of a departure from my normal holiday decor philosophy of ‘more is more’ lol, but there’s reason for that — this year is the first time that Ryan and I will be away for the holidays (honeymooning), so while we will still definitely decorate, it has to be pieces that are EASY. More importantly, if I buy new pieces I don’t want to break the bank if I’m only going to enjoy them for a few weeks this year. 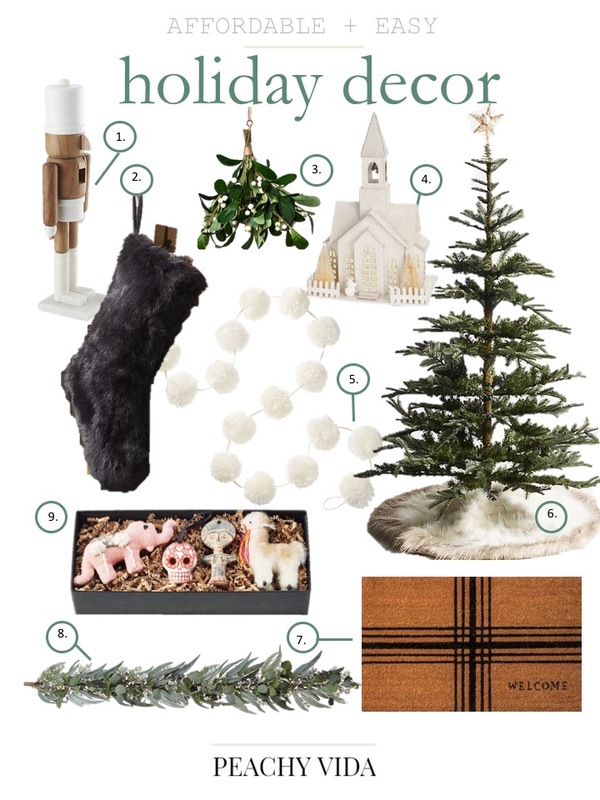 I think a lot of you can probably relate to these same wants for your own holiday decor, so I really hope you enjoy these picks!! Even better, everything is under $140!! As with all my decor, super into a neutral palette, lots of greenery, texture and special touches (those ornaments, omg). V into lattice patterns lately and I got a million q’s on our tree skirt last year and this one is near identical (which justified it being the only item over $100 because it definitely has longevity). Also, we won’t invest in a real garland this year but the below faux one is lovely. Previous Post What I’m Packing for Aspen! !